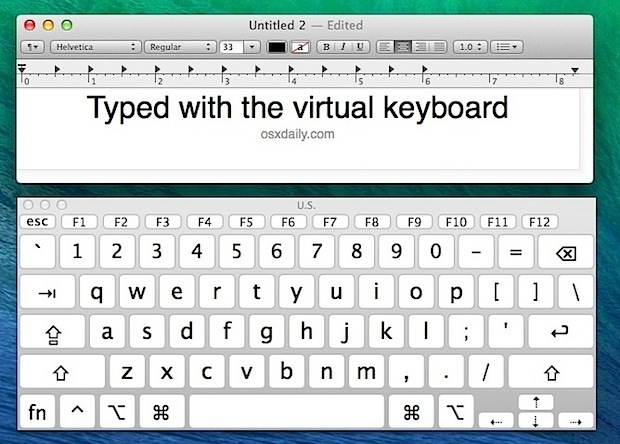 The Virtual Keyboard feature of OS X is exactly what it sounds like, it’s a software-based keyboard that can be used as an auxiliary onscreen keyboard to type anything on a Mac. These virtual keys are pressable by clicking on them with a cursor, rather than tapping the physical keys on a hardware keyboard. This onscreen keyboard can input text anywhere, so not only can it be used for standard typing but it can be used for entering passwords, and even key presses for games and other apps. It will also always hover atop of existing windows or screen content, and in a lot of ways it’s like the software keyboards on iOS devices, minus the touch screen of course, but it is equally as universally applicable across everything on the Mac. 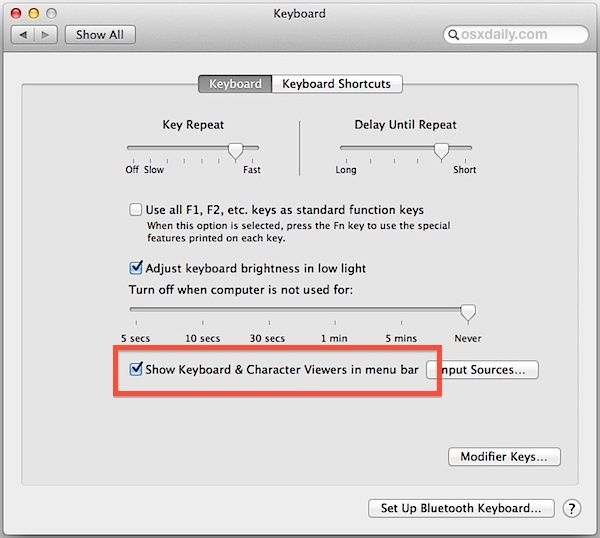 Closing out the screen keyboard must be done by clicking the actual close button on the keyboard window itself, or by going back to the keyboard menu and choosing “Hide Keyboard Viewer”. It is intentionally unresponsive to the normal Command+W close window keyboard shortcut. Virtual keyboards are primarily aimed at providing a typing solution for those who find it easier to use a cursor than keyboard and it does wonders for that, but it can serve other purposes too. It’s wildly useful if you wind up in a situation where the hardware keyboard on a Mac suddenly stops working, be it from water damage or otherwise, especially when the liquid exposure tricks didn’t work out. And, as an educator recently showed me, it can function as an incredibly helpful tool to learn touch-typing, particularly for those who are learning to type without looking at their fingers (cardboard box over the hands and all! ), because the keys being pressed show as such on screen. Yes there are apps out there that serve the same function, but this is already built into Mac OS X, which makes it an excellent immediately usable solution that doesn’t require downloads or purchases. Hi i did as suggested, but the keyboard option deselects itself. Help!! There are other reasons someone might want to use the virtual keyboard. Need a hint? If a hacker installs a keylogger, he/she will be able to know your passwords, accounts numbers, telephone numbers or anything you type on your standard keyboard. I LOVE this tip!! I have physical disability problems, esp spine and shoulders. Sitting near enough to use the connected keyboard isn’t easy. I could get wireless but those are the least ergonomic of all keyboards out there (mac I mean). Too small, have to warp your wrists into bad angles. Not good. There wasn’t another full size wireless other than MS and man… that thing was fugly. Clunky and not good either. THIS is wicked good!! And “James” – sure sure… we all know how some random hacker can remotely screw with the keyboard but I could also get hit with a flying goose – it DID happen to Fabio after all. Life is full of chances James… can’t live in mom’s basement forever. Paul Horowitz, you are my savior! My kid spilled his drink, ruining my keyboard. I needed to be able to use the computer and could not wait for the new one to be shipped. Is there a way to pull it up on the log-in screen? I spilled water on my keyboard and need to access a user with a password. Hi, I had the virtual keyboard set up earlier and had to close it because it wasn’t going away off the top of a video even when I clicked on the video (not the keyboard). Clicking elsewhere on the screen had made the keyboard disappear in the past, but somehow not that time. Now, I can’t get it back. The box is checked that says that the keyboard viewer is showing in System Preferences, but there is no icon on the menu bar to click on. I have deselected that check box and reselected it many times and no icon appears. I hope you can help me figure out how to get it back! @Trecman: It’s probably too late for you, but you set “Enable Sticky Keys” in the Accessibility settings under “Keyboard” to make Modifier-keys like the Apple-key stick. Thank you for the solution, Ben! This tip helped me be able to fully use an ipad pro as both input and screen for my mac mini (Luna Display dongle required). Thanks! But what about multilingual virtual keyboard on Mac OS X? When I open the keyboard and mouse section, there is not an option to turn this feature on. Is there somewhere else to do it? Thanks a bunch! I needed to use the feature because I’m currently learning Thai, but my current keyboard has no Thai symbols and I don’t really want to use any stickers. i’m trying to the reset system management controller on my mum’s mbp by asking her to let me have virtual control of her screen through messages. once screen sharing is enabled, would this work through the virtual keyboard? I can’t figure out how to click the question mark, @, etc… Please help! Maybe enable “Sticky Keys” and then press Shift? It works well for me. Thank you. Is there a way to turn off the second number pad? Usually it opens with the normal keyboard, but more and more often now, it randomly opens that second number pad on the right side. thanks for the great tip Paul. I once lost my keyboard and could not login to macbook pro and this is the way to do it. Virtual keyboard! Not only is the virtual keyboard useful but engaging it fixed the indicator light on caps lock key which is now working again normally.